While many visitors to the Butler County Fair stopped by the Butler County Prosecutor's booth and had an opportunity to spend time with Prosecutor Michael T. Gmoser and his staff, that was only part of his participation in and support of the fair experience. Well known for his compassion for victims of crime, he is almost as compassionate about his honey. A man with many hobbies, Gmoser is an also amateur apiculturist. 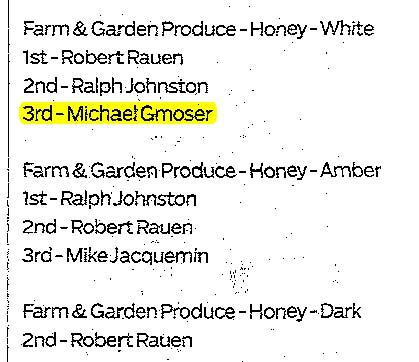 This year, he earned 3rd place at the fair for his White Honey, which he bottles in his garage. "The Butler County Fair is about so much more than the grandstand events held every evening, and the politicians shaking hands with the public, " said Gmoser. "It's about striving to be the best you can be, whether as a young person raising a prize goat for a 4-H project, or baking that award winning pie. Everyone has a chance to participate and earn recognition for being the best of the best here. If you don't get first place this year, you ramp up your game, learn from other participants how to be better, and continue to strive for that blue ribbon next year."